With this house on the market I feel like my decor crazy has been stifled of late. I love change and doing new things in my decor but with the house up for sale I feel like I cannot express my style or change much up. So it is the little changes I can do that give me some creative pleasure. This was my front porch starting with some fall decor. I had my summer yellow front door. I felt it gave the front of the house a more cottage feel. We replaced the yellow cottage door with our other wooden front door that matches the garage door. It is a better door and I thought the buyers would like that it matched the garage door. Terry switch the doors out for me. I left the yellow door in the shed so if the buyers want to put the yellow one back on they can. 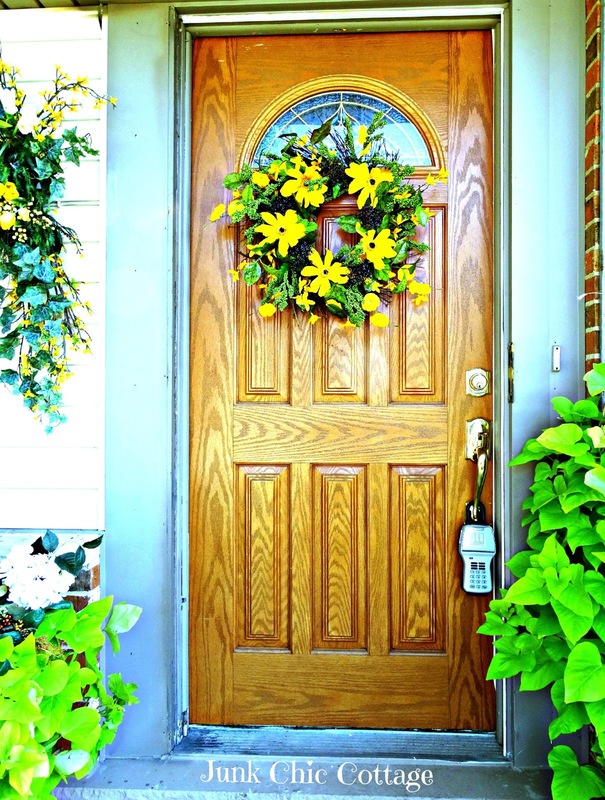 I like the wood front door it feel less like summer than the yellow one did. 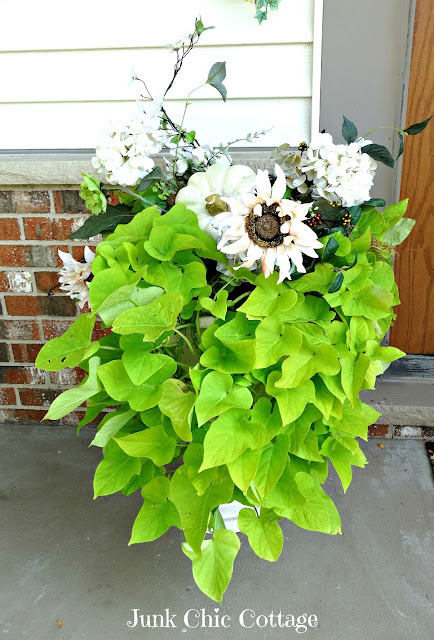 I brought out one of my white urns that I had my Christmas tree in and re planted this sweet potato vine. I added some fall pumpkins and fall faux flowers to the potato vine. I kept my sweet yellow boots from summer and added some fall faux daisies. My sweet potato vines are really going strong. The vines stretch across the front picture window. So just a few change ups to my front porch. Ohhhhh how I am hoping we get a contract soon and we can move onto a new place I can release my decor crazy on!!!! Just a big hug and thank you to Benita from Chasing Quaintness. I got this special little sachet in the mail from her on Friday. Sooooo sweet and it smells heavenly. Benita just sent it to be sweet and to say thank you for being blogging friends. She has a kind heart. Love my pumpkin sachet Benita. Hugs & thank you so much!!!! Love the wreath you have on the door and I can't believe how big that sweet potato vine is. Mine never get that big.....I like the yellow door better, but agree you have to make changes that will fit many buyers. Sweet friend, HELLO! Your Terry is like my Ruben. So accommodating and interested in fluffing up the nest as much as we do. The door looks fabulous, warm and inviting. I wish you so much success in selling your beloved cottage, and I know you are going to find another home that will be the perfect canvas for your artistic energy! LOVE THAT ENTRANCE! Hi Kris. You are the only person I know who has front doors to switch out and I have to say...I'm jealous! Your wooden one is perfect for fall and I like how you've decorated the porch. Your description of "creative pleasures" is sweet. How's it going? Are you showing the house? I hope it sells quickly too. Any nibbles? That was probably a good move to replace your front door. I've sold most of my large architectural pieces to the owner of Rust & Feathers as well as other furniture to another antique shop owner. It really makes our house look bigger which is an asset for buyers. I think of your often and pray you're able to move on soon! I hope you get a contract soon. I know how it feels to wait on that! I like your wooden door. It's nice that you have options for a buyer. I look forward to moving one day myself but dread the whole process of it. It's very stressful. I believe if it's meant to be it will happen though. You have done some great things to help sell your home and I am sure it will pay off soon. Oh, this brings back memories of us selling our home, when we bought this one. It was hard waiting for a sale wondering what was wrong with the house that we loved for thirty-three years. Truth is nothing was wrong, you just have to wait it out, until that certain someone comes along that just loves it. Good luck on speedy sell. Both doors are lovely. Fingers crossed that it sells quickly and you get more than what you asked for!! I think the switch of doors was a good idea, but I love your yellow one! Wow! for some reason, the wood door looks huge! it's beautiful! I love the potato vine you have growing, Kris. Mixed with the pumpkins and daisies, it makes an impressive display that welcomes all who enter. 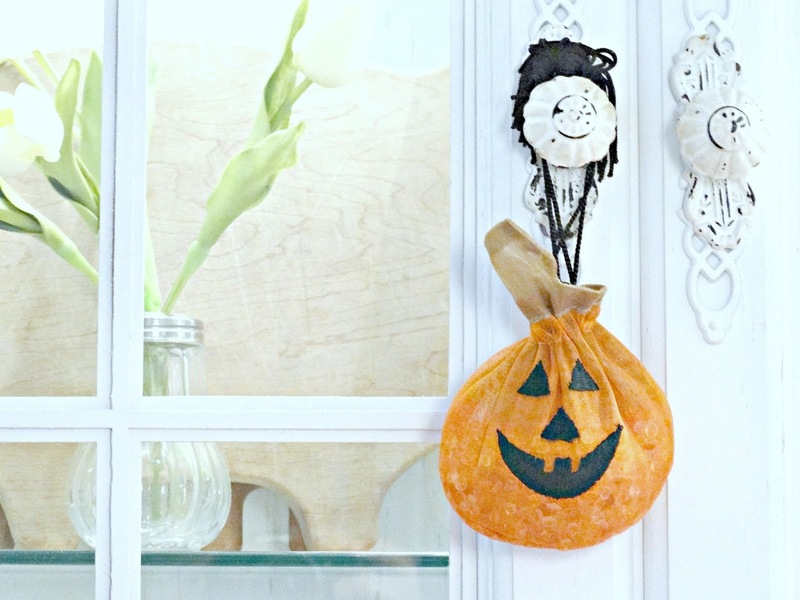 Sweet pumpkin sachet, too. I think the wood door conveys a nice warm autumn welcome to your home, Kris. I wish I could let you loose in my house to relieve your pent up creativity!! Kris the wooden door looks very handsome and inviting, plus since it matches the garage door it was a good change for sale. I love your potato vine and ahhhh those adorable yellow boots, so cute. 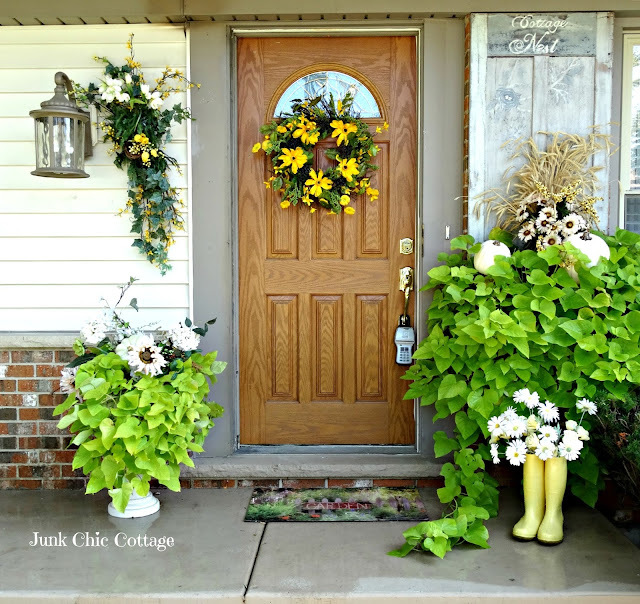 No matter what season it is you always embrace it and adorn your door with seasonal beauty. Sending love your way. I hate the time period when the house if for sale and you have to keep everything neat and tidy. Hopefully it will sell soon. People will want to buy soon in order to be in the house by Christmas. The wooden door looks great. I know how you feel about not being able to decorate. Sending you good vibes for a quick sale! The porch feels very seasonal. Kris, I wouldn't worry about the lack of your personality inside your homes decor, or the fact that right now is not a good time to change things around or create a new salvaged look for it....we love sharing along with you your experiance in changes you are doing to get it sold. You might also be the very blogger who will help ease someone else's sale with tips giving bloggers in simplifying for that perfect sale. How is the open houses going, the showings? I know it won't be too much longer, it shows wonderfully. Was just thinking yesterday...wonder what Kris is upto while her (re)decorating is temporarily on hold? Hoping you had a creative outlet to help with your transitions. Love the fall porch. Loved your yellow door...but then again the wood version may have more universal appeal. Hope all is well. Were still having 80 degree temps so I am having trouble with fall décor motivation. Love the wood front door! It is very welcoming! The vignette on the front steps are also lovely! I LOVE your wood door and it looks so pretty and welcoming. All your flowers looks so nice and I love those rain boots with the daisies. Good luck with the sale of your house. How thoughtful and nice to be gifted with the sachet from your blog friend! It's beautiful, Kris...and so welcoming! Hope it welcomes the right buyer soon! Oh my goodness, Kris! Changing a door would be a major day's project for many, but for you & Terry, it's like changing underwear! I absolutely love watching you let your decor crazy seep out - it's like my sisters & I with our vintage shopping & styling - it's a crazy sort of high. Hoping the door change is the magic spell that draws the right buyer in. It's really pretty, and I bet looks terrific with the garage door. Tell the realtor to take another photo and switch it out in the listing! Your front porch is so pretty and welcoming. Great curb appeal for your buyers! I hope you get a contract soon, but I know you will because your cottage is adorable! WOW! Your potato vine is amazing! Good luck with the sale of your home. Hi Kris! I've been absent from blogging, but hope to catch up now. 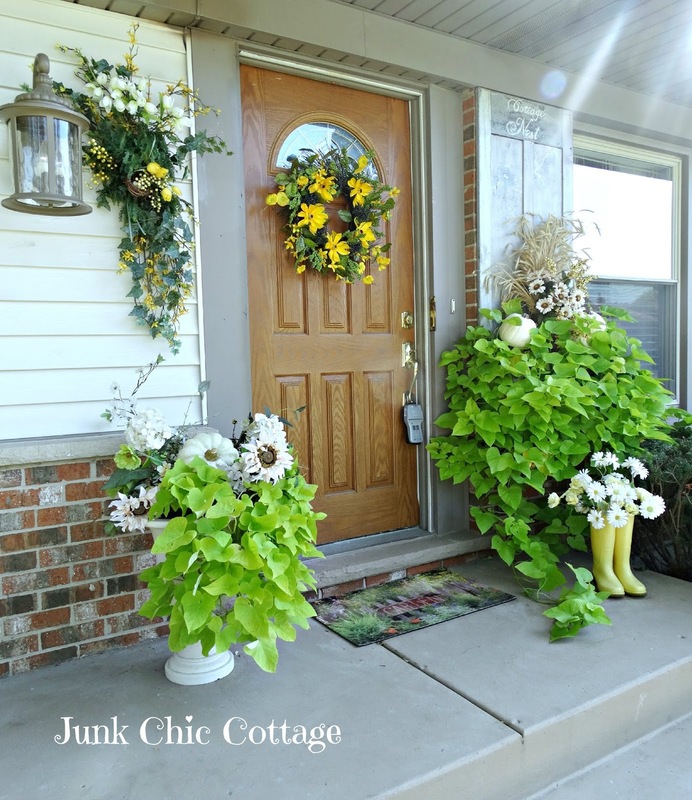 Just love how your front door looks, and those vines are amazing! I wish you all the best with your house search and selling. You'll definitely have fun getting your 'decor' on with a new house to make all your own. The door looks great, Kris. Your urns look fantastic! I can't believe your sweet potato vines are still going strong. Love how they look with the pumpkins. LOVE the door change Kris! Hope you get a contract on your home soon! I love the yellow door...but I also like the wooden one too, and if it matches the garage door then it makes sense to put it back on for the buyers to see. 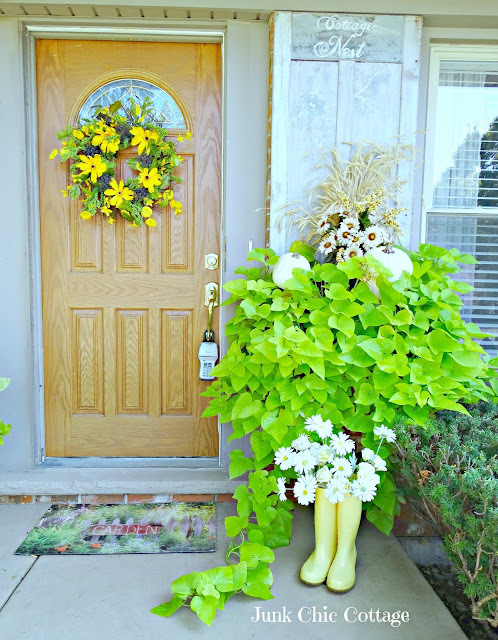 Your decorating is so pretty, love the potato vines replanted in the other pot and the yellow boots are so cute there...the fall flowers and pumpkin are the perfect touch! Love that little pumpkin that Benita sent you - she is such a sweet person!! Blogging friends are the best!! The door looks very nice and fallish. Do hope that you get it sold quickly. I am so surprised that it hasn't sold yet. Any new on the job for Terry? I can't believe your potato vines. They are going like gang busters. The door looks good. I didn't enjoy this part of selling. I understand but at the same time, can't people have some sort of an imagination. Not to sound old and stuffy but this younger generation amaze me, everything has to be just the way they want it. Talk about curb appeal Kris - just gorgeous - I'd be SO drawn to your home ! I can't believe someone hasn't jumped all over your home yet - I would if I were looking - in a heartbeat ! That kitchen - the entry way - well all of it ! Hope all works out beautifully soon! I love your decor, Kris, and I'm sure you will have fun at your new place. Thank you for your sweet comment over at my blog. You have no idea how much it means to me. Just praying for you and keeping healing thoughts for you. You got this girl and will win the C battle!!!! Everything still looks as beautiful as ever! 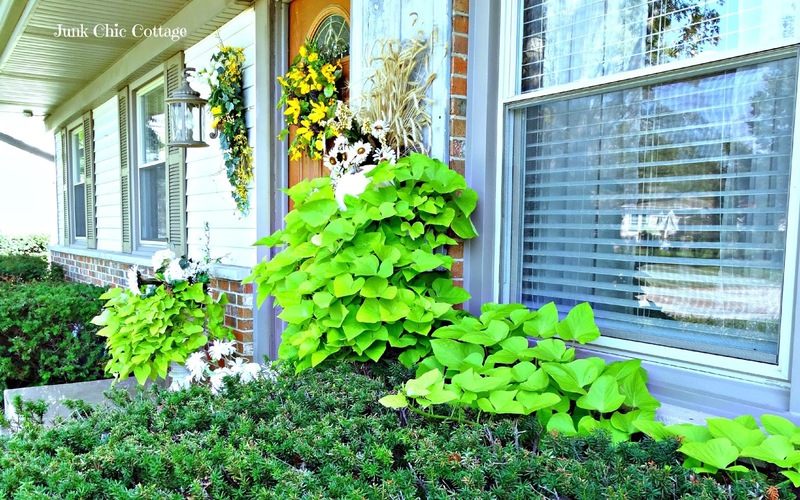 I am still awed by that beautiful sweet potato vine and how great it is growing! The boots are just too adorable! I do hope you enjoy the sachet..it was just a little something to thank you for your wonderful friendship! Hugs!! I'm anxious to see your new home too! Crossing my fingers that this house will sell soon. near future. Keep me updated!!! It must be so hard to stop yourself from your usual nesting....especially with holidays fast approaching! I am so envious of your sweet potato vine. Bruce dug mine up when he was a puppy and I never replanted. Good thing, too- Jack is a digger. 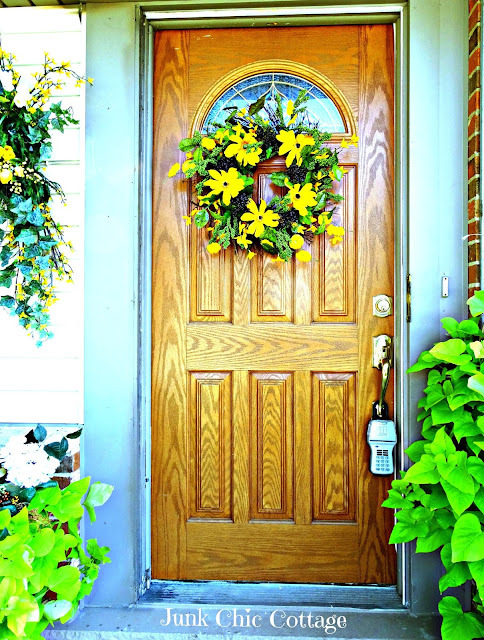 Your sweet curb appeal will draw people in- it looks so pretty. I am shocked Kris your home has not sold yet. I suppose people may be waiting until after the Holiday? No worries, you know it will eventually. Showings are just the more an inconvenience when they call at the last minute. At least you don't have toddler toys to pick up everywhere and are probably ready on point. The door change out was brilliant! Looks fantastic. Keep us posted. I am sure things will get going. You have a lovely home. Well, you are a decorator extraordinare for certain, but a gardening guru, too! Those vines are just unbelievable! Gorgeous! Hi Kris, I have some catching up to do - you're moving!? Well, you will have another house to decorate!! Looks great! Where are you moving to? Not sure yet Cindy. Terry has not gotten word on a new job yet. With the market being slow we wanted to try and sell it before the holidays hit and things come to a crashing halt. If we sell before he has a job offer we will just pack things up and put them in storage until we know. We just wanted to get a jump on the few buyers we have right now in the market for a house. We have lots of competition and very few buyers so this might be awhile. Have a great week. The door looks great, although I love the yellow one, too. With all of that creativity bottled up, you're going to be amazing, once you are settled into a new place! I love both your doors Kris, and those yellow boots with the daisies are so sweet. I just know you'll do amazing things when you get into a new place. Here's hoping your house sells quick. Love the beautiful pictures on your blog! Your porch looks fantastic! I love sweet potato vine but it never grows for me like yours does!! Good luck to you...I have my fingers crossed you get a bid. 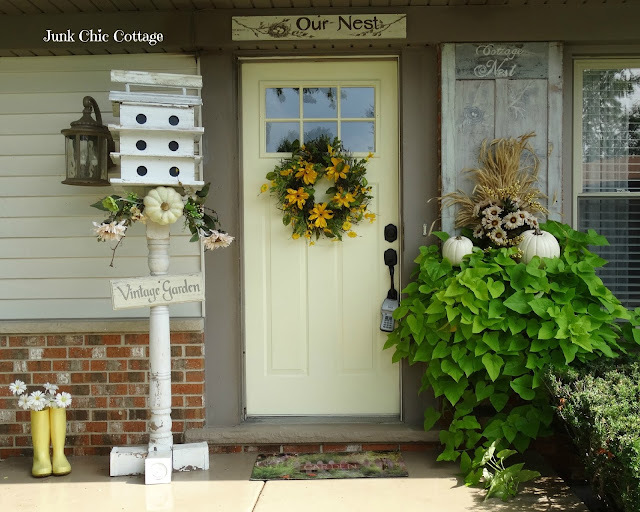 I know what you mean about changing things around… I love seasonal changes… I love your porch… I'm sure that a potential buyer will fall in love with your home. You have such a green thumb, Kris! And a way with container garden styling that rivals any garden catalog I've ever seen. Those potato vines are gorgeous, as is the door. Prayers for a buyer and the right job in the right town! I like both doors...it is so hard to choose...what a wonderful surprise for the new owners.